Wallaby is the code name for an experimental Flash-to-HTML 5 converter that Adobe has just released to the development community via Adobe Labs, the site featuring Adobe's beta technology. Wallaby, a cross-platform Adobe AIR application, is a tool that allows users to instantly convert Flash output (FLA files) to HTML5 via a simple drag and drop. It is available free for download. Wallaby, which was first previewed last fall at Adobe's Max 2010 developer conference, is featured at FITC, a Flash show in Amsterdam. "We are making this available free on Adobe Labs as experimental technology; it's something we hope to continue to iterate and get feedback on from customers," said Tom Barclay, senior product manager for Flash Professional. "I'm interested in how useful this output is, what people intend to use it for, and whether this is something we should be supporting longer term in Flash Professional as another output option or publish setting." The release is especially significant for the Mac community because this technology would make some content previously unavailable on the iOS platform viewable on the iPad and iPhone. Apple does not support Flash on its iOS devices, arguing that Adobe's multimedia technology is vulnerable to exploits, consumes too much battery life, and crashes too often. Adobe has fired back that Apple's Flash ban is an overly restrictive policy that hurts users and software makers. Not all elements from the Flash files will translate into HTML5, Barclay said. Users get the benefit of the overall design and motion graphic animations. But blend modes and filters—as well as audio, video, and ActionScript—are discarded in the translation. The output from Wallaby is essentially a combination of HTML, SVG (Scalable Vector Graphics), and CSS and is intended as a starting point. Vector graphics are converted to SVG; bitmaps are converted to image elements and JPEG files; and text is converted to paragraph elements or SVG text. The Flash timeline is converted to a group of CSS animations. Scripting allows for batch processing of multiple FLA files. Wallaby output, show in Chrome, with code below as generated by Wallaby. 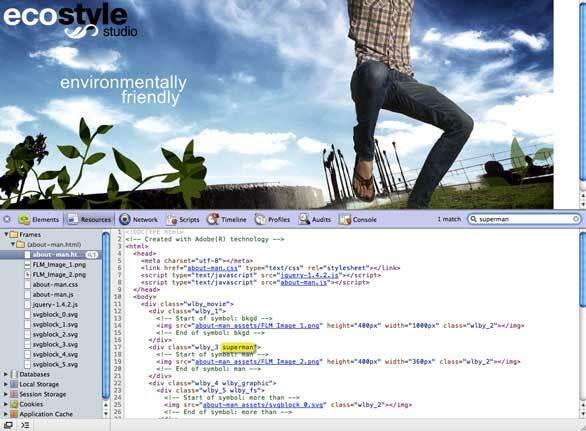 Supported Flash Professional features include: vector art and images; classic text; keyframes; MovieClips and graphics; classic, motion, and shape tweens; rollover buttons; and instance names. Unsupported Flash Professional features include: filters (except simple alpha); blend modes; dynamic masks; some TLF (Text Layout Framework) text; 3D transforms and 3D tween; audio and video; and ActionScript. Barclay emphasized that the Wallaby release is designed to make the technology widely available and to determine the level of interest. Right now, Adobe is seeking comment from the Flash community on how best to deploy Wallaby—from suggesting applications for the technology to feedback on the code and other issues. Will it eventually be added to some future version of Flash Professional? Adobe isn't making any promises, but neither is it ruling out the possibility.